Pamplona (Spain), April 2nd, 2019. Scientists at the University of Navarra (Spain), in collaboration with clinicians from the University Hospital of Donostia, have identified two biomarkers associated with the risk of suffering atrial fibrillation, a cardiac ailment that affects more than 33.5 million people in the world. In the European Union, it is present in 8.8 million people over 55 years of age and, specifically in Spain, it affects more than 4% of the population over 40 years of age. The World Health Organization considers this disease as an epidemic due to its high morbidity and mortality, and a public health problem due to its high prevalence. Researchers at Cima, Clínica Universidad de Navarra and the Faculty of Sciences, have discovered that, by analyzing a blood sample, it is possible to predict the appearance of this cardiac ailment. 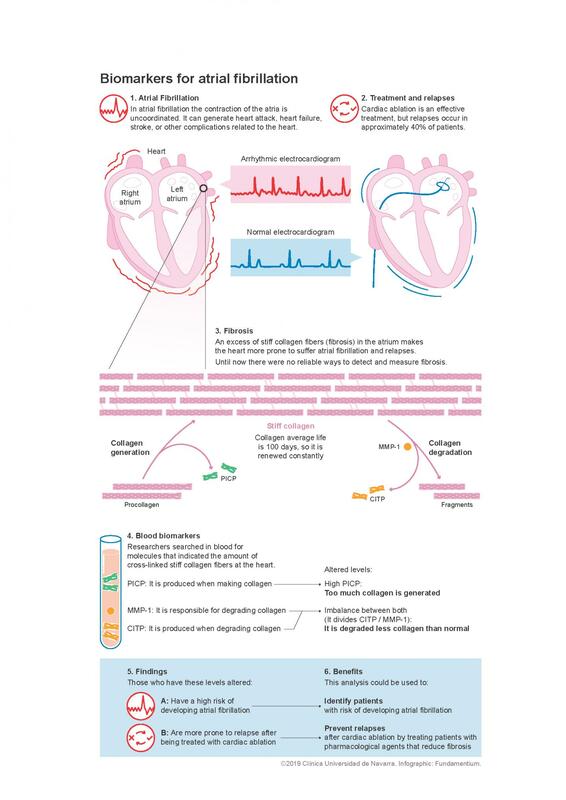 “The alteration of three molecules related to collagen metabolism (CITP, MMP-1, and PICP) determine the risk of suffering atrial fibrillation and the response to its treatment,” explains Dr. Javier Díez, director of the Cardiovascular Disease Program at Cima, Head of Research of the Department of Cardiology and co-director of the Department of Nephrology at the Clínica Universidad de Navarra. The study was performed in 392 patients, 150 of them treated with cardiac ablation. “We have found that patients with low blood levels of the CITP/MMP-1 ratio and elevated levels of PICP have a high risk of developing atrial fibrillation and that it recurred after cardiac ablation. The confirmation of these findings can lay the foundations to precisely adjust the most optimal treatment and follow-up for each patient according to these two biomarkers,” adds Dr. Díez, also from CIBERCV. Caption: From the left: Gabriel Ballesteros, Susana Ravassa, Ignacio García-Bolao, Begoña López, Javier Díez, Arantxa González, Pablo Ramos, Jean Bragard and Ujué Moreno. Clínica Universidad de Navarra, with more than 2.800 full-time commitment professionals in both of its locations Pamplona and Madrid, is a research hospital and a model in personalized medicine in our country. Our hospital is renowned for its research and teaching labor, for its prestigious professionals and its career in the diagnosis and treatment of complex pathologies. Furthermore, it is a high-resolution hospital due to its diagnosis speed, that it is possible thanks to a multidisciplinary work and the acquisition of the latest technology. With all that, Clínica Universidad de Navarra is capable of providing 46 clinical and surgical specialties. For the fifth consecutive year, our center has been the hospital with the best reputation in Spain (according to MRS ranking). Cima is the research center of the Clínica Universidad de Navarra. The scientific objective of its more than 370 professionals is to face current clinical problems and propose the most effective treatment for each patient. To transfer the results of basic research to clinical application, Cima has a Translation and Transfer unit that seeks to establish collaborations with biotechnological and pharmaceutical companies to facilitate the arrival of scientific discoveries to the patient.